This protocol describes an efficient way to monitor the cell persistence and biodistribution of human adipose-derived mesenchymal stem cells (haMSCs) by far-red fluorescence labeling in a rat knee osteoarthritis (KOA) model via intra-articular (IA) injection. Li, M., Hao, M., Jiang, D., Chen, Y., Wang, W. In Vivo Tracking of Human Adipose-derived Mesenchymal Stem Cells in a Rat Knee Osteoarthritis Model with Fluorescent Lipophilic Membrane Dye. J. Vis. Exp. (128), e56273, doi:10.3791/56273 (2017). In order to support the clinical application of human adipose-derived mesenchymal stem cell (haMSC) therapy for knee osteoarthritis (KOA), we examined the efficacy of cell persistence and biodistribution of haMSCs in animal models. We demonstrated a method to label the cell membrane of haMSCs with lipophilic fluorescent dye. Subsequently, intra-articular injection of the labeled cells in rats with surgically induced KOA was monitored dynamically by an in vivo imaging system. We employed the lipophilic carbocyanines DiD (DilC18 (5)), a far-red fluorescent Dil (dialkylcarbocyanines) analog, which utilized a red laser to avoid excitation of the natural green autofluorescence from surrounding tissues. 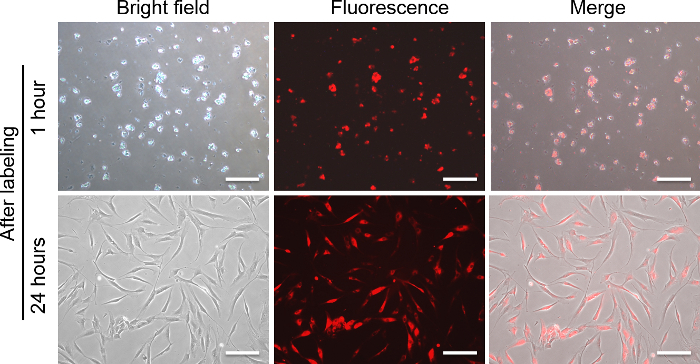 Furthermore, the red-shifted emission spectra of DiD allowed deep-tissue imaging in live animals and the labeling procedure caused no cytotoxic effects or functional damage to haMSCs. This approach has been shown to be an efficient tracking method for haMSCs in a rat KOA model. The application of this method could also be used to determine the optimal administration route and dosage of MSCs from other sources in pre-clinical studies. Knee osteoarthritis (KOA) is a degenerative disorder resulting from articular cartilage loss and progressive inflammation, which has become a major chronic disease in the elderly around the world1. However, current therapies using anti-inflammatory drugs, physical supplements, and surgical procedures may only provide temporary relief for symptomatic pain2. Human adipose-derived mesenchymal stem cells (haMSCs) have become a promising regenerative remedy for knee osteoarthritis, owing to their multipotent differentiation potential for cartilage regeneration and immunomodulatory properties3,4. Compared with pharmacological routes to investigate mechanisms of action in vivo, tracking live haMSCs in small KOA animal models is currently instructive to establish the rationale for and feasibility of haMSC therapy prior to clinical application. For preclinical testing, medial meniscectomy (MM) destabilizes the mechanical load of the joint to induce KOA in rats, which provides a relatively feasible model with consistent reproducibility5. The onset of KOA induced by MM is earlier than anterior cruciate ligament transection alone or combined with partial medial meniscectomy6. Therefore, the long-term interactions between injected haMSCs with the pathological microenvironment of KOA are often assessed in rats induced by MM7,8. Though the therapeutic efficacy of haMSCs has been extensively reported, relevant knowledge on the in vivo persistence of implanted haMSCs via intra-articular (IA) injection is scarce9,10. Hence, various cellular labeling methods have been developed, including immunohistology11, luciferase12, green fluorescent protein13 transfection, iron oxide labeling for magnetic resonance imaging (MRI)14, and numerous fluorescent cell dyes8,15,16. Compared with labor-intensive histology analyses, in vivo non-invasive imaging employs optical devices to detect the real-time distribution and dynamics of cells labeled with fluorescent signals10,17. For functional live cell imaging, cytocompatible fluorescent labeling is a sophisticated radioactive-free tracking technique to reveal cellular activities after stem cell transplantation18. Moreover, multicolor fluorescent lipophilic dyes possess advantages over amino-reactive hydrophilic dyes or fluorescent proteins, including their improved cell permeability and enhanced fluorescence quantum yields19. Thus, the protocols included here utilize a red laser to excite cells labeled with lipophilic carbocyanines DiD (DilC18(5)), which is a far-red fluorescent Dil (dialkylcarbocyanines) analog20. The red-shifted excitation and emission spectra of DiD avoids autofluorescent interference and allows deep-tissue imaging over a long period of time in live animals8. This method of tracking cells in vivo labeled with DiD is valid for monitoring transplanted stem cells, such as haMSCs, in animal models, which is essential to understand and improve current stem cell regenerative therapy. Procedures involving animal subjects were approved by the local Institutional Animal Care and Ethics Committee, with an effort to minimize animal suffering. The following protocol was approved by the Institutional Animal Care and Use Committee (IACUC) at Shanghai Ninth People’s Hospital affiliated to Shanghai JiaoTong University School of Medicine with the protocol number 063. For this surgical procedure, use 8 - 12 week old male Sprague Dawley (SD) rats with a body weight between 250 and 300 g.
Anesthetize the animals with 40 mg/kg tiletamine and 40 mg/kg zolazepam via intramuscular injection. Place the animal in a left lateral position on a heated stage. Shave the right knee thoroughly with a razor. Disinfect the surgical area with 10% providone-iodine solution followed by 70% ethanol, repeat two more times and then paint with 10% providone-iodine solution and cover the non-surgical area with a surgical pad. 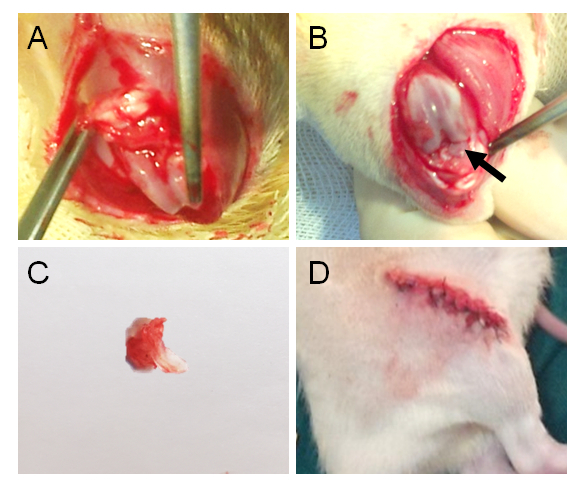 Using a surgical scalpel, make a 2 cm incision laterally along the patellar tendon to expose the jointcapsules. Use a surgical scalpel to transect the medial collateral ligament. Reflect the meniscus toward the femur. Drip sterile 0.9% sodium chloride solution on the surface of articular cartilage during the operation to prevent the cartilage from drying out. Grab the medial meniscus with forceps and cut through the meniscus at its narrowest point from the tibial attachment with a scalpel (Figure 1A). Avoid injuring the cartilage. Close the joint capsule with a 4 - 0 absorbable suture. Monitor the surgical rats until they regain consciousness. Inject 20 mg/kg gentamicin to prevent infection and 0.05 mg/kg buprenorphine through an intramuscular route to relieve pain after surgery. Maintain the rats in a temperature-controlled animal facility under a 12 h light/dark cycle for 3 - 8 weeks to onset KOA. Animals continue to receive pain medication, including but not limited to Buprenorphine (0.05 mg/kg, i.m.) and Gentamicin (20 mg/kg, i.m. ), if pain symptoms persist. Sacrifice the rats with excessive CO2 inhalation (Add a fill rate of about 30% of the chamber volume per minute with carbon dioxide to the existing air in the chamber to make the animal unconsciousness within 2-3 min. Maintain CO2 flow for a minimum of 1 min after respiration ceases.) at indicated time points (representative results are shown at 8 weeks of KOA induction ranging from 3 to 8 weeks) after the surgery. Dissect the skin and muscle around the knee joints and cut off the knee joints with a scalpel. Fix the knee joints in 4% paraformaldehyde (PFA) for 3 days at room temperature. Afterwards, decalcify the samples in 20% ethylenediaminetetraacetic acid (EDTA) for about 4 weeks at 4 °C, and change the EDTA every 3 days. Caution: Paraformaldehyde is toxic, wear appropriate personal protective equipment (PPE), such as gloves and eyeglasses. Dehydrate the samples using an automatic tissue processor. Set the menu to start a flush cycle as follows: 70% ethanol for 1 h; then 80% ethanol and 95% ethanol for 1 h respectively; followed by 2 cycles of 100% ethanol for 1 h; subsequently, xylene twice for 1 h each time and paraffin 3 times at 58 °C for 1 h each time. Caution: Xylene is toxic, so wear appropriate PPE, such as gloves and eyeglasses. NOTE: Optionally, use Coplin Jars for manual dehydration with the same set-up as the automatic tissue processor. Place the medial aspect of the intact joint face down and embed it into the paraffin block with tissue embedded into the center. NOTE: Optionally, use forceps to embed the samples into the paraffin block manually. Start to cut 5 µm sagittal sections from the medial margin of the joint for 30 µm intervals with 2 serial sections by rotary microtome. Mount sections on glass slides and deparaffinize the slides in xylene. Between the 2 serial sections, stain one slide with Hematoxylin & Eosin (H&E) staining: 0.1% Hematoxylin for 15 min, 1% Acetic Acid Solution for 10 s and 0.5% Eosin for 10 min. And stain the other slide with Safranin O/Fast Green staining: 0.1% Hematoxylin for 15 min, 0.02% Fast Green for 3 min, 1% Acetic Acid Solution for 10 s and 0.1% Safranin O for 3 min. Caution: Xylene is toxic, wear appropriate PPE, such as gloves, eyeglasses. Score the stained slides using Osteoarthritis Research Society International (OARSI) Histopathology Assessment System in rats6. Prepare DiD cell-labeling solution in 100% ethanol at a concentration of 1 mM. Protect the cell-labeling solution from light and store it at room temperature up for 6 months. Grow haMSCs with standard cell culture procedures in Dulbecco's modified Eagle's medium (DMEM) supplemented with 1% penicillin and streptomycin and 10% fetal calf serum (FCS) in a 10 cm petri dish. Detach haMSCs with 2 mL 0.25% trypsin with 1 mM EDTA prior to around 80% confluence. Neutralize trypsin with 4 mL culture medium and spin the cells at 800 x g for 3 min at room temperature. Suspend the cells at a density of 1 x 106 cells/mL in 5 mL serum-free culture medium. Label the cells by adding 50 µL DiD cell-labeling solution in 5 mL serum-free culture medium at 37 °C for 50 min. Spin the labeled cells at 800 x g for 3 min. Wash the cells two more times with 5 mL phosphate buffer saline (PBS) at 800 x g for 3 min each. Check the labelled haMSCs using a fluorescent microscope with a Cy5 filter set. Count the cells with trypan blue staining and obtain 2.5 x 106 viable cells in 100 µL PBS for injection. Eight weeks after the surgery (Step 1), anesthetize the KOA rats by intramuscular injection of 25 mg/kg tiletamine and 25 mg/kg zolazepam. Shave the right knee thoroughly with a razor to expose the joint area. Disinfect the joint area with 70% ethanol. Using a 26 G syringe needle, inject 2.5 x 106 labeled cells suspended in 100 µL PBS at the center of the triangle area formed by the medial side of the patellar ligament, the medial femoral condyle, and the medial tibial condyle (Figure 1B). Open the imaging software and initialize the in vivo bioluminescence imaging system. Position rats in the supine position in the central stage of the imaging system and close the door of the chamber. Check the "fluorescent" checkbox and select fluorescent filter sets of 640 nm for excitation, and 680 nm for emission (Figure 2A). Select field of view to D. Set pixel binning to medium (8), F/Stop to 2 and exposure time to auto. Maintain the optimal exposure time consistent to obtain comparable results across the entire study (Figure 2A). Remove the animal from the stage and monitor for recovery from anesthesia. NOTE: Place animal on an heating pad covered with 2-3 layers of toweling. Choose the units of radiant efficiency for the measurement of fluorescence (Figure 2B). Select regions of interest (ROI) for analysis and quantify fluorescent signals from each image (Figure 2C). Repeat the procedure of in vivo imaging for each rat sequentially to study haMSCs longitudinal retention in the joint. NOTE: We suggest imaging the animals' fluorescent signals by in vivo imaging system once every two days for the first week after injection and once every week until the signal cannot be detected. In order to induce KOA model, MM was performed in the right knee joint of SD rats (Figure 3). Eight weeks after surgery, rats were sacrificed and the serial sections of knee joints were evaluated with both H&E and Safranin O/Fast Green staining (Figure 4). For H&E staining, the surface of the articular cartilage exhibited rougher borders in the surgery knees than the normal joint without surgery. For Safranin-O/Fast green staining, we observed decreased proteoglycan (red staining) and increased fibrillated collagen (green staining) in the surgery joint compared with the normal one, which indicated the progression of degenerative KOA phenotypes induced by surgery. To resemble the progression of human KOA, rats were sacrificed at 3 weeks, 6 weeks, and 8 weeks after MM to assess pathogenesis and determine the time of therapeutic interventions. DiD labeled haMSCs was visualized in KOA rat model by an optical in vivo imaging system. 1 h after labeling, DiD labeled haMSCs exhibited round shapes in vitro. The labeling efficiency reached about 95%. After 24 h, cultured DiD labeled haMSCs exhibited long spindle shapes, indicating DiD did not change the adherence ability of haMSCs in vitro (Figure 5). Eight weeks after surgery, 2.5 x 106 DiD-labeled haMSCs were injected into joints with KOA. Here, DiD labeled haMSCs were observed in the local joint from day 0 (8 weeks after the surgery) till day 70 post injection (18 weeks after the surgery) by using an in vivo imaging system (Figure 6). Figure 1: Schematic surgical field for the MM surgery and injection area for cell delivery. (A) This schematic diagram depicts the surgical area, which is highlighted by blue color. (B) This schematic diagram indicates the injection site within the red circled area. Acronym definitions are as follows: MM, medial meniscus; MCL, medial collateral ligament; LM, lateral meniscus; LCL, lateral collateral ligament; PL, patellar ligament. Please click here to view a larger version of this figure. 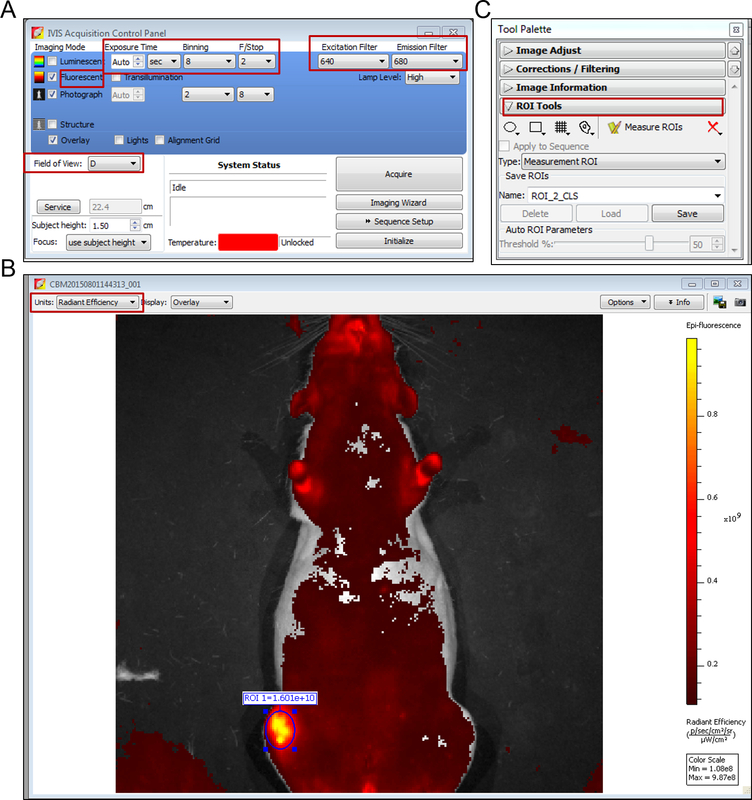 Figure 2: Screen shots of in vivo imaging software. (A) Key settings of parameters for fluorescent image acquisition are highlighted with red squares. (B) Radiant efficiency is chosen as the unit for the measurement of fluorescence. (C) In the Tool Palette, regions of interest (ROI) are circled for fluorescence efficiency measurements. Please click here to view a larger version of this figure. Figure 3: The procedures of surgically-induced KOA. (A) Exposure of the knee joint space. (B) The inner structure of knee joint, with a black arrow indicating the medial meniscus. (C) The dissected medial meniscus. (D) The joint space and skin are closed. Figure 4: Representative histological pictures of knee joints and statistical analysis for OARSI score of KOA. (A) Eight weeks post MM surgery in rats, serial sections of knee joints were evaluated with H&E and Safranin O/Fast Green staining. H&E staining showed the thickness of the cartilage in the surgery knee was reduced. Safranin O/Fast Green staining showed decreased proteoglycan (red staining) and increased fibrillated collagen (green staining) in the surgery knee compared with normal knee. Scale bar = 500 µm. (B) Statistical analysis for score of osteoarthritis in normal joints and KOA joints (n = 3). The data are expressed as mean±SEM. *indicates p <0.05. Please click here to view a larger version of this figure. Figure 5: Morphology of DiD-labeled haMSCs. Bright field, fluorescent and merged Images of haMSCs at 1 h after labeling are shown in the top panel.Bright field, fluorescentand merged Images of haMSCs at24 h after labeling are shown in the bottom panel. Scale bar = 50 µm. Please click here to view a larger version of this figure. Figure 6: In vivo imaging of DiD-labeled haMSCs. After injection of 2.5 x 106 DiD-labeled haMSCs, representative images of KOA rats are shown. DiD labelled haMSCs were detected for up to 9 weeks locally in the joints of KOA rats. This figure has been reproduced from the publication of Li M et al8. Please click here to view a larger version of this figure. Safety standards and biodistribution studies of stem cell therapy are urgently needed before we can bring regenerative stem cell treatment for KOA from the bench to the bedside. However, the pathological environment of disease plays an important role in the persistence and biodistribution of transplanted haMSCs10. Recently, our group demonstrated that intra-articular injection of haMSCs persisted longer in a pathological KOA environment than did injections under normal conditions8. It is possible that the inflammatory and degenerative microenvironment may recruit mesenchymal stem cells for repair and subsequently favor the retention of injected haMSCs1,21. Furthermore, the safety and efficacy profiles of haMSCs may be influenced by the timing of cell delivery regarding the severity of KOA, so that optimization of the progression of KOA in laboratory animals will provide valuable data for supporting clinical trials. With the aim of resembling mild to moderate severity of human KOA, rats induced by MM are allowed to develop KOA ranging from 3 to 8 weeks. In this study, the morphological change of cartilage was assessed by histopathological scoring 8 weeks after surgery, which offers a relatively feasible model with a moderate degree of KOA to investigate the efficacy and safety of haMSCs8. We demonstrated here a simple and feasible method to label haMSCs with far-red fluorescent lipophilic membrane dye for long-term pre-clinical efficacy evaluation. The drawbacks of this technique are that the imaged tissue should be near the skin and a substantial amount of labelled haMSCs are required for sufficient signal acquisition due to the modest quantum yields from DiD. Although an in vivo optical imaging system enables non-invasive longitudinal studies of haMSCs biodistribution in KOA models, trends in cell number and location can only be discerned in general. The analysis of stem cell fate, in particular cell proliferation and differentiation, will be addressed by also utilizing fate mapping and high-resolution microscopy imaging. Currently, a wide variety of labelling techniques are available for in vivo stem cell tracking, including radioactive labels, nanoparticles and viral transduction of reporter genes22,23,24. However, radioactive labeling as well as viral transduction of stem cells may interfere with the genetic properties of cells, which subsequently may affect stem cell proliferation and survival in vivo16. Moreover, tracing stem cells using MRI by uptake of nanoparticles as contract agent requires improved spatial resolution via a strong magnetic field, which may raise concerns about the sensitivity of this technique25. Fluorescent cell dyes, such as PKH26, CM-DiI and CFSE exhibit varying degrees of cytotoxicity and offer a relatively limited duration (up to 4 weeks) of labeling adipose tissue derived cells15. In contrast, DiD exhibits weak fluorescence in aqueous solutions. Once incorporated with a lipid membrane, DiD diffuses uniformly within the cell membrane and express stable far-red fluorescence19. DiD labels viable cells and does not affect their proliferation and function18. More importantly, the dyes do not transfer from labeled cells to unlabeled cells unless there is a direct membrane interaction between those cells26. The far-red excitation and emission spectra of DiD prevents autofluorescent interference from surrounding tissues and provides deep-tissue imaging in live animals. These features enable DiD labeling as an ideal long-term tracking technique to study the fate of implanted haMSCs intra-articularly. Therefore, we have demonstrated a reliable methodology to monitor DiD labelled haMSCs over a period of 63 days in a rat model8. Within the protocol for DiD-labeled haMSCs tracking in a KOA rat model, the critical steps to obtain reliable and feasible results are to make sure that: 1) the meniscus toward the femur is completely cut through in each rat model for consistent onset of KOA, 2) there is an optimized ratio of 10 μL DiD dye against 106 haMSC cells for a 50 min staining, 3) the in vivo detection threshold for DiD-labeled haMSCs is between 104 and 105 cells, while above 106 cells is recommended in this protocol. Once this technique is mastered, the application of this method could be used to determine the optimal route or dosage for administration of MSCs in pre-clinical studies. This protocol can be easily adapted for the long-term pre-clinical evaluation of in vivo biodistribution of mesenchymal stem cells (MSCs) from other sources, including bone marrow and umbilical cord blood. In light of the prospective for stem cell fate into KOA animal models, immunohistology study of xenogeneic haMSCs, such as Ki67 for proliferation8 and collagen II for articular cartilage differentiation27, can be combined with this technique. Meng Li, Ming Hao and Wen Wang are current employees and stock option holders of Cellular Biomedicine Group (Nasdaq: CBMG). The other authors declare no conflict of interest. The current study was supported by Shanghai Innovation Funding (1402H294300) sponsored by the Science and Technology Commission of Shanghai Municipality (CN) to Dr. Wen Wang. We would like to thank Dr. Guangdong Zhou (National Tissue Engineering Center of China) for his technical assistance and scientific advice for this manuscript. We would also like to thank Mr. Huitang Xia (Shanghai Ninth People’s Hospital) for his help in animal welfare. Loeser, R. F., Goldring, S. R., Scanzello, C. R., Goldring, M. B. Osteoarthritis: a disease of the joint as an organ. Arthritis Rheum. 64, (6), 1697-1707 (2012). Lane, N. E., Shidara, K., Wise, B. L. Osteoarthritis year in review 2016: clinical. Osteoarthritis Cartilage. 25, (2), 209-215 (2017). Wang, W., Cao, W. Treatment of osteoarthritis with mesenchymal stem cells. Sci China Life Sci. 57, (6), 586-595 (2014). Burke, J., et al. Therapeutic potential of mesenchymal stem cell based therapy for osteoarthritis. Clin Transl Med. 5, (1), 27 (2016). Bendele, A. M. Animal models of osteoarthritis. J Musculoskelet Neuronal Interact. 1, (4), 363-376 (2001). Gerwin, N., Bendele, A. M., Glasson, S., Carlson, C. S. The OARSI histopathology initiative - recommendations for histological assessments of osteoarthritis in the rat. Osteoarthritis Cartilage. 18, Suppl 3. S24-S34 (2010). Janusz, M. J., et al. Induction of osteoarthritis in the rat by surgical tear of the meniscus: Inhibition of joint damage by a matrix metalloproteinase inhibitor. Osteoarthritis Cartilage. 10, (10), 785-791 (2002). Li, M., et al. In vivo human adipose-derived mesenchymal stem cell tracking after intra-articular delivery in a rat osteoarthritis model. Stem Cell Res Ther. 7, (1), 160 (2016). Zhou, B., et al. Administering human adipose-derived mesenchymal stem cells to prevent and treat experimental arthritis. Clin Immunol. 141, (3), 328-337 (2011). Desando, G., et al. 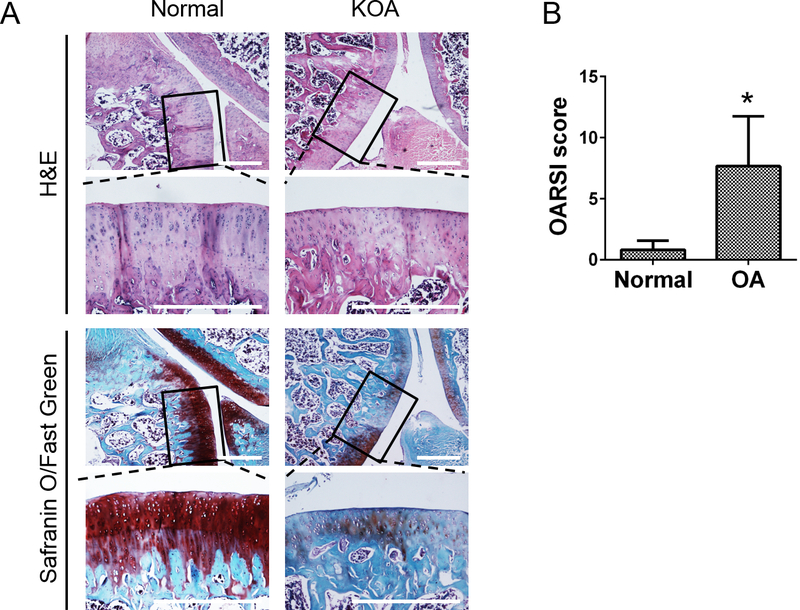 Intra-articular delivery of adipose derived stromal cells attenuates osteoarthritis progression in an experimental rabbit model. Arthritis Res Ther. 15, (1), 22 (2013). Riester, S. M., et al. Safety Studies for Use of Adipose Tissue-Derived Mesenchymal Stromal/Stem Cells in a Rabbit Model for Osteoarthritis to Support a Phase I Clinical Trial. Stem Cells Transl Med. 6, (3), 910-922 (2017). Bai, X., et al. Tracking long-term survival of intramyocardially delivered human adipose tissue-derived stem cells using bioluminescence imaging. Mol Imaging Biol. 13, (4), 633-645 (2011). Wolbank, S., et al. Labelling of human adipose-derived stem cells for non-invasive in vivo cell tracking. Cell Tissue Bank. 8, (3), 163-177 (2007). Heymer, A., et al. Iron oxide labelling of human mesenchymal stem cells in collagen hydrogels for articular cartilage repair. Biomaterials. 29, (10), 1473-1483 (2008). Hemmrich, K., Meersch, M., von Heimburg, D., Pallua, N. Applicability of the dyes CFSE, CM-DiI and PKH26 for tracking of human preadipocytes to evaluate adipose tissue engineering. Cells Tissues Organs. 184, (3-4), 117-127 (2006). Shim, G., et al. Pharmacokinetics and in vivo fate of intra-articularly transplanted human bone marrow-derived clonal mesenchymal stem cells. Stem Cells Dev. 24, (9), 1124-1132 (2015). Chen, B. K., et al. A safety study on intrathecal delivery of autologous mesenchymal stromal cells in rabbits directly supporting Phase I human trials. Transfusion. 55, (5), 1013-1020 (2015). Chan, M. M., Gray, B. D., Pak, K. Y., Fong, D. Non-invasive in vivo imaging of arthritis in a collagen-induced murine model with phosphatidylserine-binding near-infrared (NIR) dye. Arthritis Res Ther. 17, 50 (2015). Texier, I., et al. Cyanine-loaded lipid nanoparticles for improved in vivo fluorescence imaging. J Biomed Opt. 14, (5), 054005 (2009). Honig, M. G., Hume, R. I. Fluorescent carbocyanine dyes allow living neurons of identified origin to be studied in long-term cultures. J Cell Biol. 103, (1), 171-187 (1986). Rahmati, M., Mobasheri, A., Mozafari, M. Inflammatory mediators in osteoarthritis: A critical review of the state-of-the-art, current prospects, and future challenges. Bone. 85, 81-90 (2016). Detante, O., et al. Intravenous administration of 99mTc-HMPAO-labeled human mesenchymal stem cells after stroke: in vivo imaging and biodistribution. Cell Transplant. 18, (12), 1369-1379 (2009). Hu, S. L., et al. In vivo magnetic resonance imaging tracking of SPIO-labeled human umbilical cord mesenchymal stem cells. J Cell Biochem. 113, (3), 1005-1012 (2012). Xia, Q., et al. Intra-articular transplantation of atsttrin-transduced mesenchymal stem cells ameliorate osteoarthritis development. Stem Cells Transl Med. 4, (5), 523-531 (2015). Jasmin,, et al. Optimized labeling of bone marrow mesenchymal cells with superparamagnetic iron oxide nanoparticles and in vivo visualization by magnetic resonance imaging. J Nanobiotechnology. 9, 4 (2011). Lehmann, T. P., et al. Coculture of human nucleus pulposus cells with multipotent mesenchymal stromal cells from human bone marrow reveals formation of tunnelling nanotubes. Mol Med Rep. 9, (2), 574-582 (2014). Wang, W., et al. Human adipose-derived mesenchymal progenitor cells engraft into rabbit articular cartilage. Int J Mol Sci. 16, (6), 12076-12091 (2015).